^ 5.0 5.1 5.2 中國語文月刊社. 中華民國建國以來的一件大事：國語運動. 中國語文月刊社. 1971. ^ 何秋堇. 注音符號的文化演現. 秀威出版. 1 May 2012: 49–. ISBN 978-986-221-915-7. ^ 8.0 8.1 國立臺灣師範大學. 國音學新修訂第八版. 正中書局．流傳文化．墨文堂文化. 2008: 614–. ISBN 978-957-09-1808-3. ^ 從帝大到臺大. 國立臺灣大學出版中心. 2002: 266–. ISBN 978-957-01-2210-7. ^ 台語文運動訪談暨史料彙編. Ungian Iunn 楊允言. 2008: 317–. ISBN 978-986-01-3294-6. ^ 古國順. 臺灣客語概論. 五南圖書出版股份有限公司. 2005: 7–. ISBN 978-957-11-4012-4. ^ 陳正茂. 世紀交錯雜感錄：陳正茂隨思筆記. 秀威出版. 1 February 2011: 221–. ISBN 978-986-221-624-8. ^ 蓝顺德. 教科書政策與制度. 五南圖書出版股份有限公司. 2006: 127–. ISBN 978-957-11-4108-4. ^ 志村雅久. 中華民國臺灣地區推行國語運動之硏究. National Taiwan University Dept. of Three Principles of the People . 1993. ^ 鄭惠芳. 舌尖上的粵語 (PDF). 聯合早報. 2013-06-02 [2015-08-13]. （原始内容 (PDF)存档于2015年8月13日） （中文（新加坡）‎）. ^ 中華民國聲韻學學會. 聲韻論叢. 臺灣學生書局. 1994. ^ 財團法人中華民國中山學術文化基金會. 中山先生建國宏規與實踐. 財團法人中華民國中山學術文化基金會. 1 October 2011: 564. ISBN 978-986-87530-1-3. ^ 遠流台灣館／編著. 臺灣史小事典. 遠流出版. 2000: 98–. ISBN 978-957-32-4161-4. ^ 遠見雜誌. Y"uan jian za zhi she. 1992. ^ Chinese Terms for Chemical Elements. Chemistry International -- Newsmagazine for IUPAC. IUPAC. ^ Hanyu Pinyin to be standard system in 2009 (新闻稿). Taipei Times. 2008年9月18日. ^ 中文譯音採漢語 不補助通用 (新闻稿). 聯合報. 2008年9月17日. （原始内容存档于2012年9月15日）. 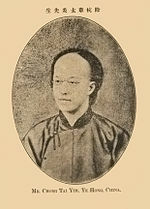 Liu, F. (1925). Les mouvements de la langue nationale en Chine (Société d'Edition ed.). Paris: Les Belles Lettres. Chu, M.-N. (1998). The tonal system of Taipei Mandarin: Cross-dialect comparison and dialect-internal variation (China, Taiwan). Unpublished master's thesis, The University of Texas at Arlington. Kubler, C. C. (1985). The development of Mandarin in Taiwan: A case study of language contact. Taipei: Student Book. Kuo, Y.-H. (2005). New dialect formation: The case of Taiwanese Mandarin. Unpublished doctoral dissertation, University of Essex, UK. Tai, J. H.-Y. (1978). Phonological changes in modern standard Chinese in the People's Republic of China since 1949 (Report). Washington, D.C.: Office of Research, United States Information Agency. Tai, J. H.-Y. (1976). Lexical changes in modern standard Chinese in the People's Republic of China since 1949 (Report). Washington, D.C.: Office of Research, United States Information Agency. Tai, J. H.-Y. (1977). Syntactic and stylistic changes in modern standard Chinese in the People's Republic of China since 1949 (Report). Washington, D.C.: Office of Research, United States Information Agency. Chan, H.-C. (1994). Language shift in Taiwan: Social and political determinants. Unpublished doctoral dissertation, Georgetown University, Washington, D.C.
Feifel, K.-E. (1994). Language attitude in Taiwan: A social evaluation of language in social change. Taipei: Crane. Yang, R. Y.-S. (1988). Language maintenance and language shift among the Chinese on Taiwan. Taipei: Crane. Cheng, Robert L. 1985. A Comparison of Taiwanese, Taiwan Mandarin, and Peking Mandarin. Language 61, no. 2: 352-77. Kubler, Cornelius C. 1979. Some Differences between Taiwan Mandarin and Textbook Mandarin. Journal of the Chinese Language Teachers Association 14, no. 3: 27-39.